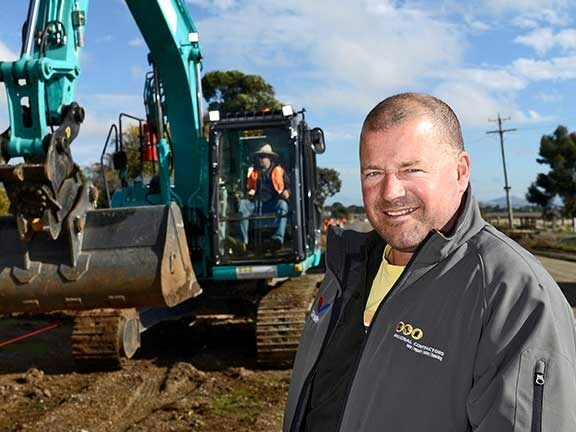 Ballarat-based equipment rental business Regional Contractors added a single Kobelco mini excavator to its hire fleet 12 months ago … and was so impressed it has since bought another seven Kobelco machines. Regional Contractors hires mostly to clients working on local building projects and road maintenance in the Ballarat area. The company also incorporates a satellite operation in Apollo Bay, plus traffic control and training operations. Owner-operator Stephen Toose established Regional Contractors almost 15 years ago to address what he saw as a gap in the market. "I was doing mechanical repairs on scissor lifts in the Ballarat area and noticed that there was a lack of suitable rough-terrain lifts for contractors to hire," Toose says. "When I bought a rough-terrain scissor lift to hire out, there was a rush of demand and that soon turned into demand for more construction and building equipment. "Before long I was hiring out everything from skid steers to water trucks to site offices," he adds. "It was only a matter of time before I added excavators to the list." Stephen bought his first Kobelco SK17SR in June 2016 and has since gone on to add another three Kobelco mini excavators and four Kobelco midi excavators. He says he has been impressed with the Kobelco’s performance and reliability. "I hadn't worked with Kobelco machinery before but I'd heard good things from people in the area and I needed something reliable," Toose says. "Whatever I bought was going to be hired out straight away, so it needed to hit the ground running." Mr Lorimar tries his hand at one of Kobelco’s SK260LC-8 (mark eight) 27-tonne excavators.